Care with dried fruit as a snack to promote good dental health. Beans, pulses, fish, eggs, meat and other proteins. Squash/Fizzy drinks should not be served. Food preferences may start to show – maybe previously enjoyed colours, tastes, textures are now refused. Independence around feeding is noticed – it is good to allow toddlers time to feed themselves as you pop a spoonful into their mouth too! Sudden changes in food likes and dislikes appear. New foods are refused – this usually decreases by the time school age approaches. Make meal time a family time - Ensure staff and children eat meals together. Praise the child who is eating well and when new foods are tried. Ensure menus are nutritious - Never insist children eat everything on their plate. 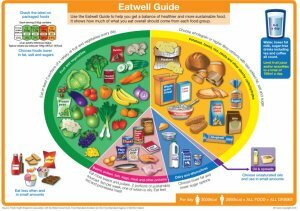 Offer food from all 4 food groups in the Eatwell Guide- This will ensure a good mix of nutrients. Aim for 3 meals and 2-3 snacks - Offer 2 courses at each meal. Offer only nutritious snacks and discourage grazing on food. Aim for 6-8 drinks a day - Give all drinks in a cup/beaker. Aim for around 100-120ml per drink. Respect tastes & preferences - Never force feed a child. Some children eat everything, others are more picky. Some may like each item separate on their plate. Limit/avoid the following on your menu/snack list - Fried foods, crisps, sweet biscuits, squash. Ensure fruit juice is diluted 1:10 and only given with a meal. Encourage active play and sleep if needed - Active play is good in short bursts or can be an organised activity.